PPT linear progress 7 stages5 PowerPoint Templates-Visually supports your ideas and define your message with our above Diagram. This image identifies the concept of stages in process. This attractive image makes your presentations professional and interactive. Deliver amazing presentations to mesmerize your audience.-PPT linear progress 7 stages5 PowerPoint Templates-Linear Progress, Abstract, Arrow, Blank, Business, Chart, Circular, Circulation, Concept, Conceptual, Design, Diagram, Executive, Icon, Idea, Illustration, Management, Model, Numbers, Organization, Procedure, Process, Progression, Resource, Sequence, Sequential, Stages, Steps, Strategy Your thoughts will come on fast and furious. 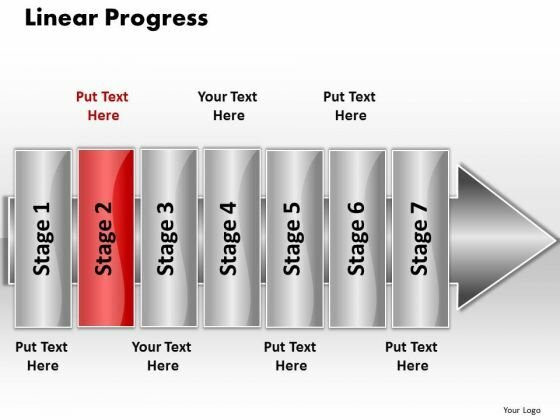 Boost your speed of thought with our Ppt Linear Progress 7 Stages5 PowerPoint Templates. Our Ppt Linear Progress 7 Stages5 PowerPoint Templates are designed by an avant-garde team. They are always abreast of the state of the art.